This is the second or third Wilkie Collins book I've read and I feel like he maybe used the 19th century equivalent of "click bait" to get readers lol. This and The Woman In White are both books with misleading titles. 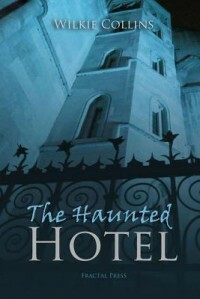 The Haunted Hotel is just under 130 pages and I would say MAYBE a dozen of those pages have anything to do with any sort of paranormal element. Even the bit that is written is a watered down ghost story at best, it's more like the person wondering if their mind might be playing tricks on them more than an actual, defined spirit. So that was a little annoying. That aside, I didn't feel like the story as a whole was all that amazing. It's mainly the story of Agnes Lockwood, a woman who is jilted by her fiancee,Lord Montebarry. Montebarry runs off and marries someone else sort of spur of the moment. A friend of Agnes then comes around asking for help getting her husband a job with Montebarry. The husband of the friend does get a position with Montebarry as a courier -- someone put in charge of handling all the little traveling details during a vacation / journey -- helping the Montebarrys with their vacationing needs in Venice. The courier then goes missing about a week and a half before Montebarry's death from complications stemming from severe bronchitis. The majority of the plot is mostly an investigation of the courier's disappearance and the death of Lord Montebarry (was it really bronchitis or something more sinister made to look like an unfortunate death via illness?). While I loved some of Collins' other works, I did not find this to be one of his better works. I did find it laughable how he kept referring to a female character in ways that were something to the effect of "she didn't look too bad for her age!" "she was good looking for a middle aged woman of 32" and the like. Otherwise, I found the plot a little on the slow and boring side. It seems to be made up mostly of bland conversations and letters back and forth. About 7-8 pages from the end or so, there is a minor plot twist or two, but then the ending felt pretty weak IMO. A quick, somewhat interesting read if you're already an established fan of Collins and you just want to be familiar with all his works or if you want to read for comparison's sake, but I wouldn't recommend starting here if you haven't read anything else by him yet.